The All Material Handling/Badger LC Series lever chain hoist has easy one hand operation and set up. It allows for operation in any orientation. Light weight and durable formed steel enclosure. Easy One Hand Operation and Setup – When the selector is in neutral and no load is present then free chain mode is entered. 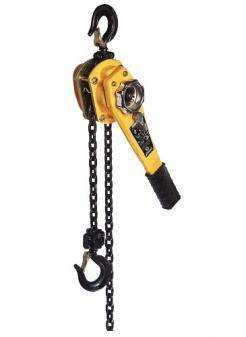 The chain can be pulled through the hoist by a pull handle for easy set up and load attachment before engaging the selector for pulling. The pull handle also acts as a chain stop. Short ratchet strokes of a non-slip rubber grip lever and 360 degree rotation requires minimal space for operation. The pull force to operate may be 20 to 30% less than others. Operation in any orientation is assured by a fully enclosed horseshoe shape chain guard keeping the load chain in contact with the lift wheel. Light weight and durable formed steel enclosure protects from contamination and can be quickly disassembled for fast and easy maintenance. Powder coating and plated finishes on exposed components are used for resistance to corrosion. Internal parts are heat treated for strength and reliability with fully enclosed gearing to protect from contamination. All gears and shafts run on caged roller bearings including the lift wheel which is machined for smooth operation and long life. Drop forged Alloy hooks are designed to stretch when overloaded before chain failure and are equipped with heavy duty cast steel safety latch attached by a bolt and lock nut. The top hook mounting articulates to aid in rigging and help insure straight line loading between hooks. Grade 80 Alloy load chain with “gun barrel” black oxide finish. Each hoist is proof tested at 1½ times the WLL and shipped with a certification of test matching the individualized serial number stamped in the nameplate. An operation and spare parts manual is also supplied in English, French and Spanish. Available in standard lifts of 5, 10 and 20 feet and spare parts are stocked in USA. Unchained units and bulk chain are also available for customers to make their own custom lifts if assembled and tested per ASME B30.21 before being placed into service.